Days after the king of the modern internet — Facebook founder Mark Zuckerberg — found several of his social media accounts in the hands of hackers, similar attacks have befallen the NFL and other high-profile Twitter accounts, leading the social network to investigate. Twitter tells Mashable that it was looking into several recent hack attacks, the most recent of which included someone taking control of the NFL Twitter handle on Tuesday afternoon. Shortly after noon Tuesday, the NFL Twitter account posted a note announcing that commissioner Roger Goodell had died. While the Tweet was quickly deleted, it was shared about 2,300 times prior to being taken down. 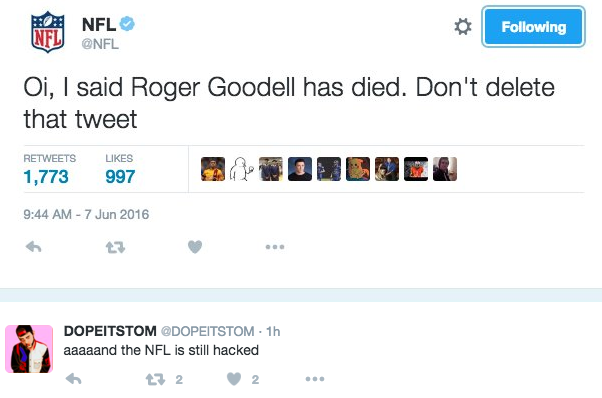 The hacker also posted several follow-up Tweets, including one that chastised the organization for taking down the Goodell had died message. The NFL Twitter hack came just a day after rapper Drake’s account was compromised. That attack included Drake supposedly Tweeting that followers should follow another account and Snapchat user. For its part Twitter said in a Tweet last night that it will cross check its own data with data from recent password leaks to see if there are any commonalities. While it’s unclear what data Twitter is checking, there was a recent data dump of passwords from the 2013 hacks of LinkedIn, MySpace, Tumblr, and other services, Mashable points out. The company also noted that it’s always a good time to ensure your passwords are secure.